We live in an age where we can assume any identity online, limited only by imagination and typing speed. And what New Yorker doesn’t yearn to be a real-estate mogul? 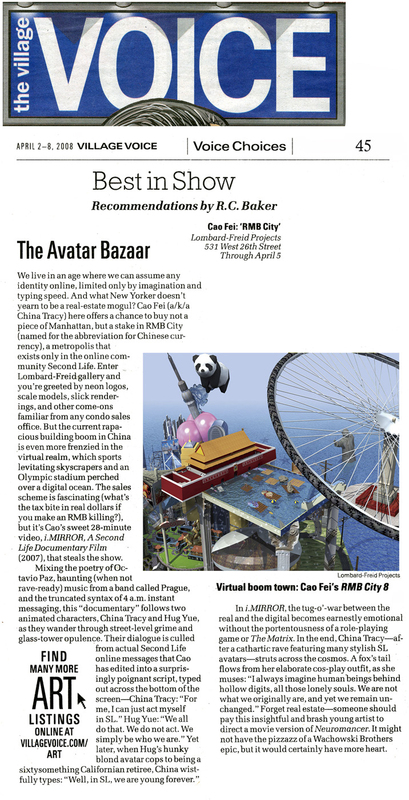 Cao Fei (a/k/a China Tracy) here offers a chance to buy not a piece of Manhattan, but a stake in RMB City (named for the abbreviation for Chinese currency), a metropolis that exists only in the online community Second Life. Enter Lombard-Freid gallery and you’re greeted by neon logos, scale models, slick renderings, and other come-ons familiar from any condo sales office. But the current rapacious building boom in China is even more frenzied in the virtual realm, which sports levitating skyscrapers and an Olympic stadium perched over a digital ocean. The sales scheme is fascinating (what’s the tax bite in real dollars if you make an RMB killing? ), but it’s Cao’s sweet 28-minute video, i.MIRROR, A Second Life Documentary Film (2007), that steals the show. In i.MIRROR, the tug-o’-war between the real and the digital becomes earnestly emotional without the portentousness of a role-playing game or The Matrix. 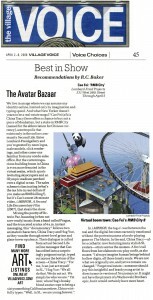 In the end, China Tracy-after a cathartic rave featuring many stylish SL avatars—struts across the cosmos. A fox’s tail flows from her elaborate cos-play outfit, as she muses: “I always imagine h man beings behind hollow digits, all those lonely souls. We are not what we originally are, and yet we remain unchanged.” Forget real estate—someone should pay this insightful and brash young artist to direct a movie version of Neuromancer. It might not have the pizzazz of a Wachowski Brothers epic, but it would certainly have more heart.